Technology doesn't have to take creativity out of the classroom. 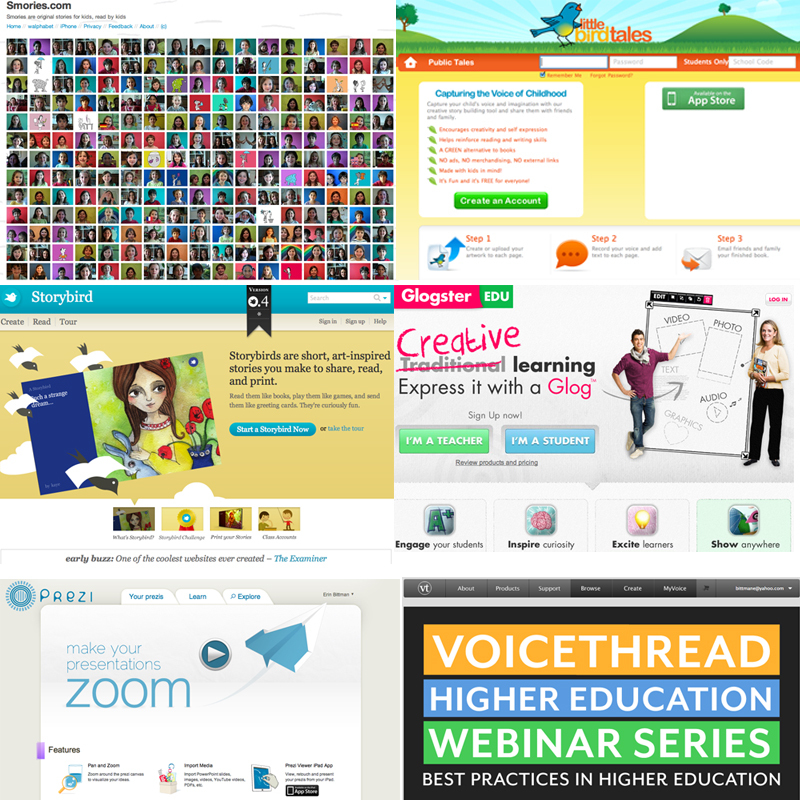 Check out these web 2.0 tools that help kids get inspired, and make learning fun in a constructivist classroom! Smories inspires kids to create original stories through video production. Students videotape themselves reading their story and publish it online for kids around the world to hear. They can listen / watch other children read stories as well. Plus, Smories has short-story competitions that schools can take part in. Smories is a fantastic resource for the classroom because children have a voice. Their story is viewed as a valuable treasure that must be shared with others. Little Bird Tales - Students upload their own drawings or photos and record their voice narrating their own original story. Little Bird Tales is a great tool because it keeps children's creativity alive. Kids aren't limited to only choosing images from a folder, they can upload or create their own on-line. This form of digital story-telling would make an awesome keepsake gift for parents. Their work is published online, so it can't get ruined or lost. Parents can look back at their children's writing, drawing, and hear their little voice years later! The tool could be used to create one large digital book of of all your students' artwork, a field guide to showcase facts in an interactive way, or for fun fictional stories. Story Bird - Kids get inspired by artwork to create an original story. Sometimes students aren't feeling inspired and just don't know what to write about. With Story Bird, kids choose images and make up their very own unique story to go along with the picture. Students must use their inference skills to depict an image. What is the character feeling? Where does the setting take place? What's the plot? It's up to kids to decide after they carefully examine every detail of their image. There is no right or wrong answer. Lightning Bug - Great resource to help gets develop a story. Lightning Bug helps kids organize their ideas into mind maps, develop characters, and create story structure. This site gives kids confidence to become a creative story teller. Sometimes students have millions of amazing ideas that they have trouble organizing and piecing together. Lightning Bug is a guide to help them gather their ideas together. What-If Genie - If kids aren't feeling inspired, have them ask the story genie! The genie randomly generates a "What If?" question for kids. The what if questions are crazy and imaginative, ones kids would have a blast writing about! Shidonni - Students create their very own imaginary world. Then, they create their very own, one-of-a-kind pet and make it come to life! Students take care of their pet, learning about what pets need. Shidonni is a great tool to help kids get comfortable with technology, improve their digital drawing skills, and get them inspired to write an original story about their pet and the whimsical, fantasy world it resides in! Voice Thread - Kids type or add an audio or video clip voicing their thoughts and opinions on a topic. They can even doodle on images to point out things they describe in their post. This is a great tool to keep discussions going outside of the classroom. For my K-3 classroom, Voice Thread is a great tool for sharing student's work with parents. Parents are able to comment, giving positive feedback to class work and projects. Plus, Voice Thread is a fantastic tool to use if there is a student absent. Teachers can post homework assignments and leave comments that help guide a child through the work. In addition, if a child is absent for an extended period of time and is working on a large project, the teacher and student can comment back and forth to each other, without having to be connected at the same time. With Skype, conversations go on in present time. Parties must be on at the same time to chat. Voice Thread, on the other hand, allows teachers to leave video, audio, or text messages to the student whenever and wherever. Edmodo - A social-networking site that is kid-friendly. Students and teachers can connect with each other in or out of the classroom. Kids can store documents, keep track of their progress, and work together in small groups on projects. Edmodo is a great tool for educators because teachers can connect with other teachers from all over the world to share resources and ideas. It's a better choice than facebook because you don't have to worry about cyber-bullying or any inappropriate content. Click here for ways to incorporate Edmodo into your classroom. Skype in the Classrom - Skype is a fantastic resource for teachers to connect with schools internationally. Besides connecting with schools, teachers can have famous guest speakers come in with the click of a button! Kate Messner, an author, has a list of lots of authors who skype with classes for free. What a great resource! After teachers read a book to their class, they can connect with the author of the book on skype and chat about it. Skype can also be used to take virtual field trips. Prezi - A cloud-based, dynamic slideshow with non-linear views, great for presentations. Prezi is like one huge digital poster of slides. You zoom in on content as you discuss it with your class. Plus, you can embed videos into your presentation. I think Prezi is a great education tool because it keeps students engaged. It's much more entertaining than powerpoint. Kids aren't sitting and viewing slide after slide. Instead, they see the full presentation as one large image to get them interested in the subject matter. Then, you zoom in on different areas to describe your topic, helping kids relate the content to the "big picture" or the main topic of discussion. What's great about Prezi is its easy navigation. If a student has a question about a previous "slide," you don't have to flip through a million slides to find it. All you have to do is zoom out and return to a previous topic. I like it because content is condensed into one, simplified area, making it convenient to jump back and forth between slides during a group discussion. Glogster - Students can organize notes, link documents and websites, play songs, add images, and embed videos all in one digital poster. Kids create visual concept boards. Their concept boards help reinforce important lessons, making ideal study guides. Furthermore, kids have fun constructing their Glogster layout. It's a fantastic tool for the classroom because kids can create a glog for all different subjects. Students are able to condense a load of information into one visual representation for easy access. Furthermore, for a class assignment in CI-247, my team members and I used glogster to showcase different countries. Each country glog included natural resources, maps, the country's landscape, and songs that helped kids gain an interest in different cultures around the world. The glogs magically transported kids to another country, without leaving the classroom!